Are More People Viewing LinkedIn Profiles Anonymously? There are an awful lot more of these people than I thought. Is this a trend? People viewing your profile in “private” mode (the nicer name that replaced the old “anonymous” mode) are a fact of life on LinkedIn. Designed for recruiters and Human Resources people – the ones that fund LinkedIn – private mode allows them to do their jobs more efficiently. And I can see that – an HR person may scroll through a couple hundred LinkedIn profiles, quickly rejecting most of them. The last thing he or she needs is forty of those people bugging him about why he looked at their profile. Last week I had a look at my own Who Viewed Your Profile statistics. I have a premium subscription so I can see who viewed my profile going back ninety days. 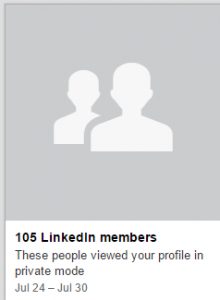 Linkedin now seems to clump your private mode viewers into one weekly number (like my screen capture above). This made it easy (albeit with a lot of scrolling) to add up my private viewers for each of the last 13 weeks and see what percentage of my profile visitors do so in private mode. Now, I am a pretty active LinkedIn user, so I get a lot of profile views. But this amounted to around 800 private profile views in three months. 800! Almost ten people every day. As a self employed consultant, I am pretty sure I was not checked out by 800 recruiters this past quarter (actually, I can tell the number of recruiters who viewed my profile in private mode had to be less than 135 over that time period. The math is a little arcane so I have left it out. Anyone who is that nerdy can contact me and I will explain it). Then around the same time I was making this discovery , I came across this post by Allen Quinn, “5 Reasons Millennials Aren’t Using LinkedIn” In his post, Allen maintains that millennials don’t like the idea that people can tell when a millennial has viewed their profile. After trading messages Allen freely admits his evidence is anecdotal, but it is an interesting idea, and does seem plausible. After all, the millennial crowd is used to the anonymity of Facebook and Twitter where no one knows you visited their profile. So that leaves the question: Is this a trend on LinkedIn? More and more people viewing profiles anonymously? If so, is it a good one, being like other social networks, or a bad one, where we can’t see who has viewed our profiles?